THE Zambia National Women’s Lobby (ZNWL) has charged that women across the country should vote for candidates that will promote their welfare and touch their lives positively. ZNWL chairperson Beauty Katebe stressed the need for women to participate effectively in the forthcoming elections and urged them to vote wisely. Ms. Katebe complained that lack of women’s participation in decision-making in Zambia was inimical to democratic progress as it ultimately denied the female gender full participation in governance of the country. She advised women to use their votes wisely and shield their children from unsavoury political consequences of thuggery and violence. “I know the pains of losing a child, especially a grown-up child. So, I urge all women not to allow politicians use their children for political gains. Women should stand out and expose anyone who is trying to cause confusion. I am appealing to women to take charge and make sure that there is peace in this country. ‘‘We should expose anyone that is trying to use our children to cause confusion. 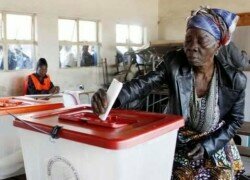 We should also pray for Zambia, pray for a peaceful 2016 elections and make sure that we vote wisely,” Ms Katebe said.